If you’ve been involved in a recovery program in Phoenix, AZ, you’ve probably heard of halfway houses. You may be wondering if this option is right for you or a loved one. A halfway house in Phoenix, AZ can be the ideal situation to help an individual transition to independent, sober living. These settings are often recommended by recovery programs in Phoenix, AZ, and may be an integral part of maintaining a sober lifestyle after treatment is completed. Following is an overview of halfway houses in Phoenix, AZ and why they are effective. Definition: A halfway house in Phoenix, AZ is a transitional living facility for individuals who are in recovery from drugs or alcohol. The home is designed to provide a place they can live until they are ready to live on their own. It offers a structured environment where they can gain skills for successful long-term recovery and full re-entry into society. What to expect: Those living in a halfway house in Phoenix, AZ are expected to follow the strict guidelines of the home. Residents are expected to stay sober, submit to regular inspections of their rooms and undergo random drug testing. House rules generally include a curfew as well as assigned chores for each resident. Each person is also expected to pay rent and contribute toward other household bills. Residents: Those living in a halfway house in Phoenix, AZ may be there for a variety of reasons. They may be transitioning from an inpatient recovery program in Phoenix, AZ. They may live there due to a court order that is part of criminal sentencing. Residents are those who are in recovery from drug or alcohol abuse. Regulation: The structure of the halfway house in Phoenix, AZ provides the guided lifestyle that those in early recovery sometimes need to remain sober. Strict policies about substance use, curfew, finances and household responsibilities help individuals develop healthy habits that they can take into their future lives. Results: This setting has proven to be effective for those leaving recovery programs in Phoenix, AZ. Research has indicated that those in recovery who live in a sober living home are less likely to experience relapse or arrest. Additional research revealed that veterans who lived in a halfway house were more likely to experience aftercare retention and treatment. The halfway house seems to provide the safe setting that many of those in recovery need to hone their skills and prepare for a successful sober lifestyle. 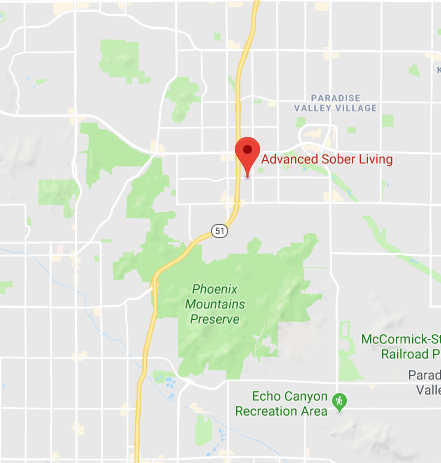 If you or a loved one need a halfway house in Phoenix, AZ, contact the professionals at Advanced Sober Living. Set in a comfortable, home-like environment, our sober living program in Phoenix, AZ is designed to support men through the challenges of early sobriety and assist them in developing skills that will prepare them for independent living. Within the framework of a structured yet supportive community, you are given the time, tools and support to continue healing while learning to live a new way of life. Within a short period of time, you’ll be working through a program with a sponsor, finding employment, exploring educational opportunities, and returning home to re-integrate with your family and loved ones. Reach out to us today to learn more.